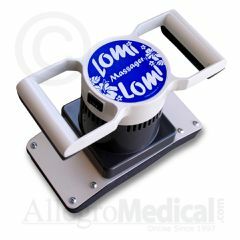 Help relieve your shoulder, neck, back, thigh and foot pain with the Lomi-Lomi Massager by Allegro Medical. This sturdy, reliable and maintenance-free personal Lomi Lomi hand-held massager has 2 speeds: High (3500 rpm) and Low (2800 rpm). The Lomi Lomi personal massage therapy massager is intended for the entire household and is more economical than the competing electric back and body massagers. Relaxing. Easy To Use. Sturdy. Relieve Tense Muscles. Improves Circulation. Reduce Stress. Everyday. I really like this massager, good quality for the price you pay. I think it's a little heavy, so I would prefer a lighter version. Very cheap switch on an otherwise well constructed heavy machine makes this one of the worse online purchases I've ever made. Comfortable. Relaxing. Easy To Use. BEST WHEN APPLIED BY ANOTHER PERSON. DIFFICULT TO USE BY ONES SELF, EXCEPT FOR UPPER LEGS. GIVES VERY DEEP AND PENATRATING MESSAGE TO BACK, SHOULDERS, LEGS WHEN APPLIED BY ANOTHER PERSON. Easy To Use. Comfortable. Relaxing. Everyday. Relieve Tense Muscles. Reduce Stress. do you have a video re how it works?? OR a detailed description?OR prodict flyer or instruction shhjet? or large picture?